Perfect starter kit for any electronics hobbyist, every value is packed individually, easy to use and store. The set includes 15 Values Variable Resistor, 10pcs for each Value, total 150pcs. Wide assortment of values allowing you to get exactly the resistance you need. Welcome feel free to contact if you have any question! We suppy the best service ! The rotary encoder can count the number of pulse output during rotation in the positive direction and reverse direction through the rotation and this rotation counts are not limited. With the key on the rotary encoder, you can reset to the initial state, that is, counting from 0. 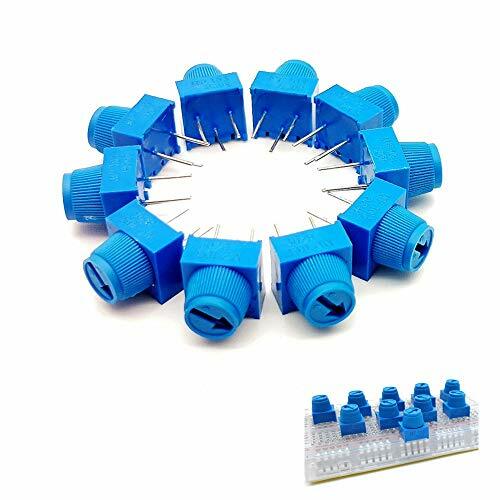 Total Length: 31 mm / 1.2"
9 different kinds single linear rotary taper potentiometer, 3 terminals, single linear, with standard knob. 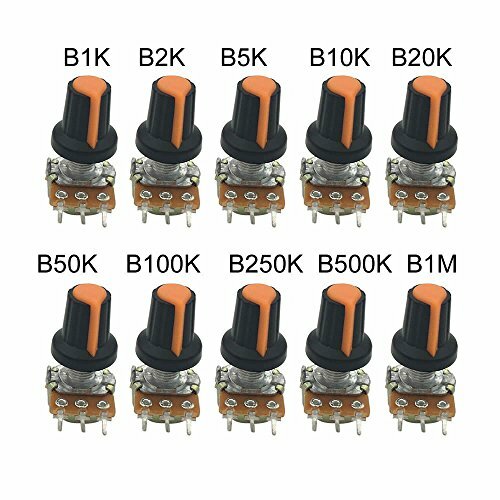 B1K B2K B5K B10K B20K B50K B100K B500K B1M Ohm knurled shaft linear rotary taper potentiometer for Arduino. Type: single linear(with nuts and washers). Single linear rotary taper potentiometer, 3 terminals, single linear, with standard WH148 knob. 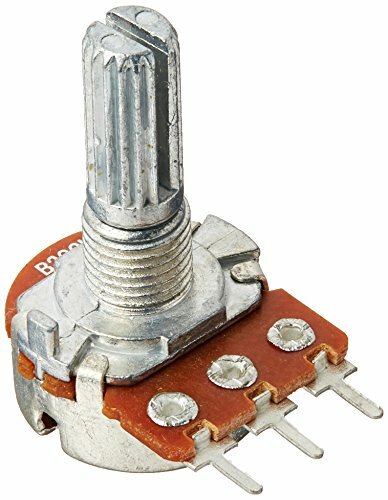 B10K Ohm knurled shaft linear rotary taper potentiometer with nuts,washers and caps for Arduino. 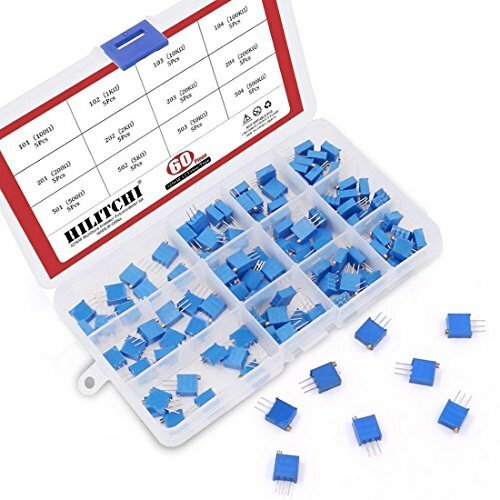 Hilitchi 60pcs High Quality 3296W Multiturn Trimmer Potentiometers Assortment Kit. Specifications: Model : 3296; Withstand Voltage : 500V; Rated Power : 1/2W Resistance Value : 100 (101), 1K (102), 10K (103), 100K (104), 200 (201), 2K (202), 20K (203), 200K (204), 500 (501), 5K (502), 50K (503), 500K (504) Tolerance: 10%; Adjustment Type: Top Adjustment; Mounting Type: Through Hole (DIP) Turn Number: 25; Resistance Change Type: Linear; Temperature Coefficient: 100ppm/ C; Resistive Material: Cermet; Color: Blue Package Include: 60pcs The Package Contains 12 Values, Each 5pcs Packed in A Rugged Convenient Re-sealable Plastic Storage Case. Package Quantity: 100 (101) - 5pcs 1K (102) - 5pcs 10K (103) - 5pcs 100K (104) - 5pcs 200 (201) - 5pcs 2K (202) - 5pcs 20K (203) - 5pcs 200K (204) - 5pcs 500 (501) - 5pcs 5K (502) - 5pcs 50K (503) - 5pcs 500K (504) - 5pcs This set is organized by size in a transparent storage case for quick access and protection. 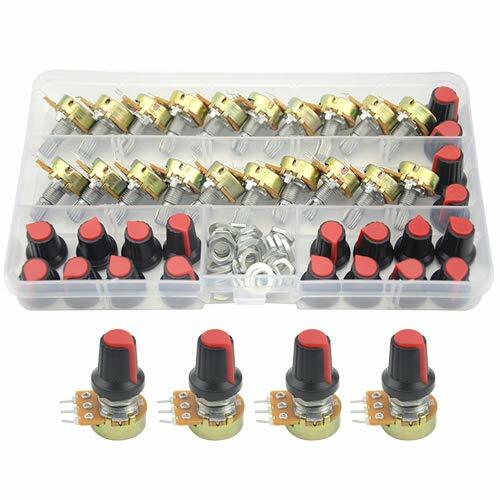 High Quality 3296W Multiturn Trimmer Potentiometers Assortment Kit. Model : 3296W, Mounting Type: Through Hole (DIP), Resistive Material : Cermet. Package Include: 60pcs, The Package Contains 12 Values of Each 5pcs, Packed in A Rugged Convenient Re-sealable Plastic Storage Case. Use for Device Interior or Printed Circuit Boards Which Adjustable the Resistance Less. 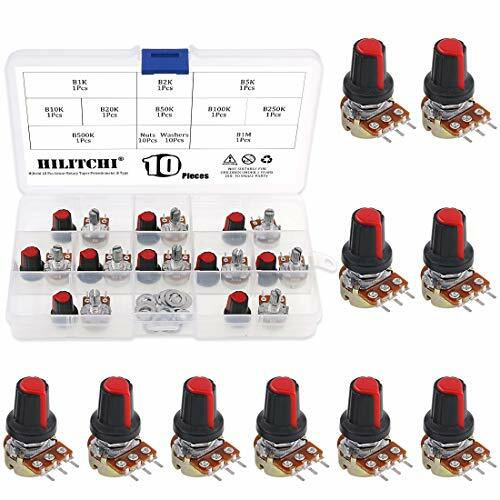 You Need - A complete potentiometer assortment kit, so that you always have the potentiometers you need. You Desire - A premium potentiometer kit that is easy to store and use. You Get - Everything you want, need and desire with the Plusivo Potentiometer Assortment Kit plus a mini screwdriver included. 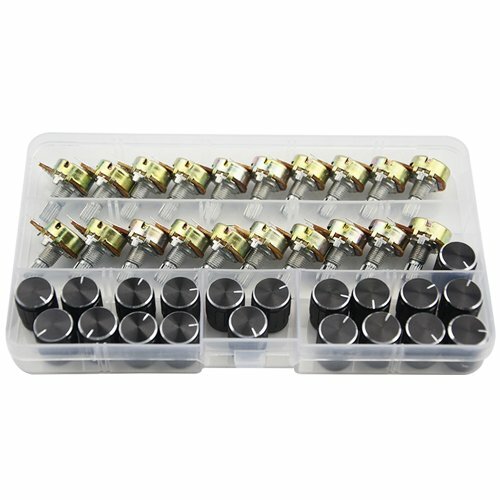 This potentiomer kit is a necessary accessory when you build your DIY electronic circuit - A major benefit of the Plusivo Potentiometer Assortment Kit is that it includes multiturn trimmers, Single Linear-High Precision Variable Resistor with Knobs that you may need in your electronic projects. The kit also contains nuts and washers plus it comes with free mini screwdriver. 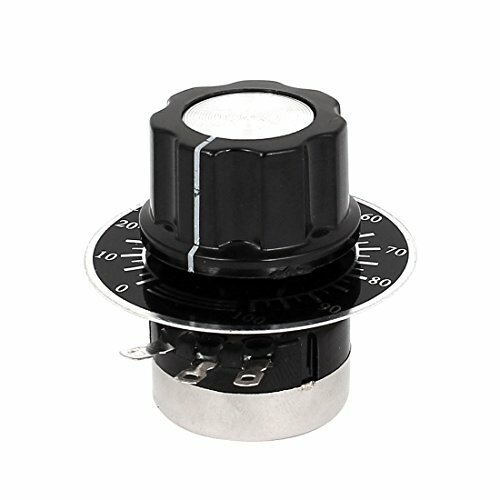 You can depend on it to always find the potentiometers that you need. 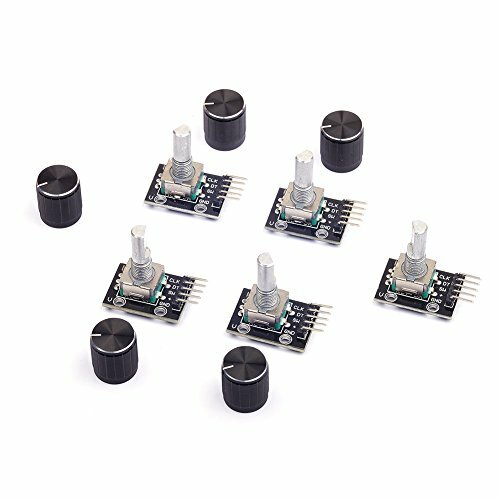 Large assortment of potentiometers - The Plusivo Potentiometer Assortment Kit includes 10 commonly used potentiometers, you'll never run out of ideas for your projects. Ergonomic design - The Plusivo Potentiometer Assortment Kit is a joy to use. It comes with an organizer box that allows you to easily store the components in a box. Just open the box and pick up the items that you need. 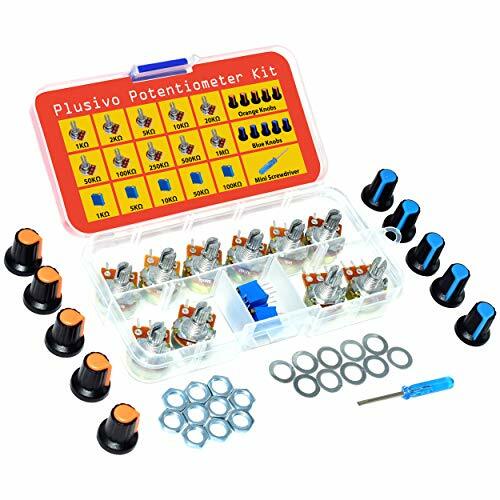 You'll never want to be without the Plusivo Potentiometer Assortment Kit - Don't delay, buy today. 100% Satisfaction Guarantee! 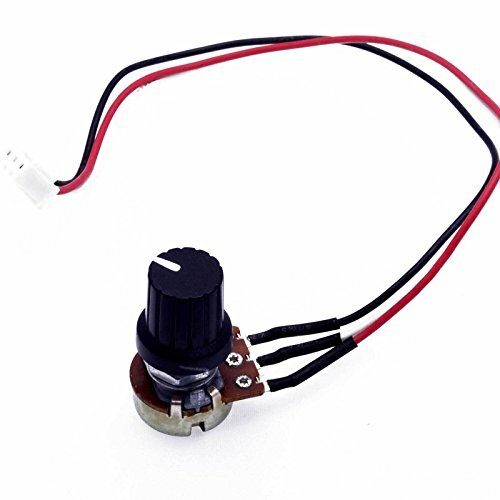 Our potentiometer kit is backed by our manufacturer 30 day money back guarantee. Good Quality Single linear rotary taper poteniometer, 3 terminals, single linear, with standard WH148 knob. 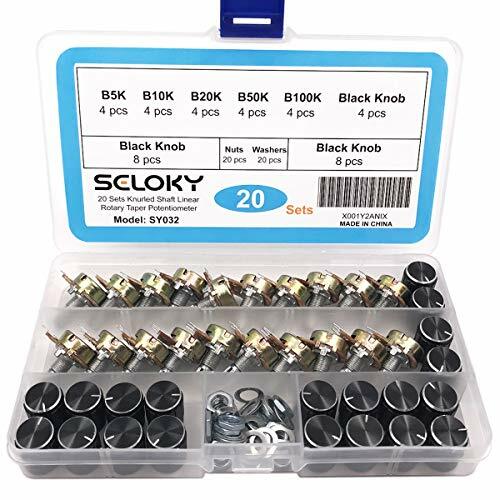 Kit contains B5K-B100K Ohm( The set includes 5 Values Resistor, 4pcs for each Value ) knurled shaft linear rotary taper potentiometer with nuts,washers and caps for Arduino. Specification: description: features: 200K ohm, 1/2W power, 3 terminals, single linear (Type b), suits most standard knobs. Top adjustment Type and knurled shaft for easy operate in daily use time. Main used to control electrical devices such as volume controls on audio equipment. Knurled shaft with split design for push-on knob. Single linear rotary taper potentiometer, 3 terminals, single linear, with standard knob. 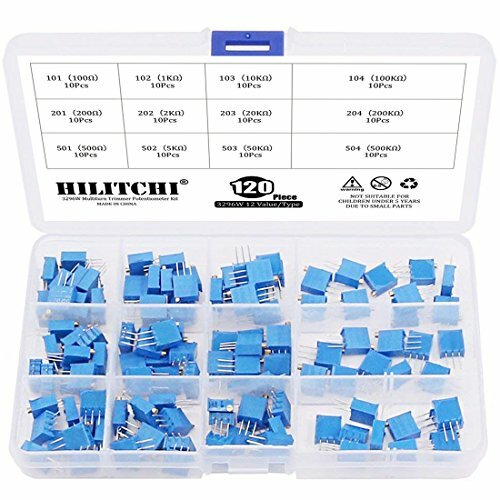 Hilitchi 120pcs High Quality 3296W Multiturn Trimmer Potentiometers Assortment Kit. Specifications: Model : 3296; Withstand Voltage : 500V; Rated Power : 1/2W Resistance Value : 100 (101), 1K (102), 10K (103), 100K (104), 200 (201), 2K (202), 20K (203), 200K (204), 500 (501), 5K (502), 50K (503), 500K (504) Tolerance: 10%; Adjustment Type: Top Adjustment; Mounting Type: Through Hole (DIP) Turn Number: 25; Resistance Change Type: Linear; Temperature Coefficient: 100ppm/ C; Resistive Material: Cermet; Color: Blue Package Include: 120pcs The Package Contains 12 Values, Each 5pcs Packed in A Rugged Convenient Re-sealable Plastic Storage Case. Package Quantity: 100 (101) - 10pcs 1K (102) - 10pcs 10K (103) - 10pcs 100K (104) - 10pcs 200 (201) - 10pcs 2K (202) - 10pcs 20K (203) - 10pcs 200K (204) - 10pcs 500 (501) - 10pcs 5K (502) - 10pcs 50K (503) - 10pcs 500K (504) - 10pcs This set is organized by size in a transparent storage case for quick access and protection. Package Include: 120pcs, The Package Contains 12 Values of Each 10pcs, Packed in A Rugged Convenient Re-sealable Plastic Storage Case. [QUALITY METAL AND CARBON FILM]: Good selection of metal and carbon film, reasonable noise and wear characteristics. Functioning as a variable voltage divider, these pots are with standard knobs. No odorousness, built well and good style and functionality, all worked within tolerances. Please test the resistance on them before using, if they are not suitable or with other problems, please come to us. We promise to solve them for you. [NICE LITTLE 10PCS SIZES] B1K B2K B5K B10K B20K B50K B100K B250K B500K B1M 10pieces in total, everything you need in one little package. 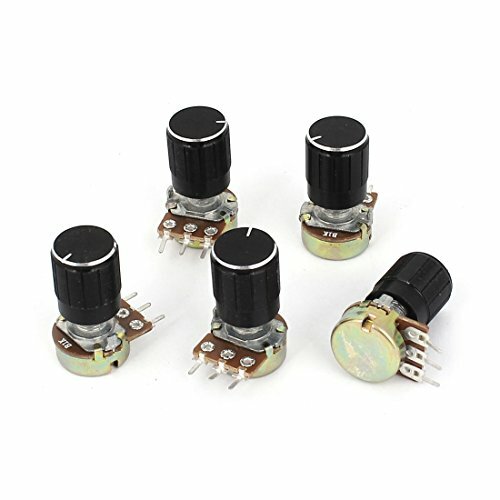 Nice little kit of potentiometers, it comes with a selection of different ohm pots. What's more, it also has the nuts, washers, nuts and knobs. [MULTIPLE APPLICATION] For volume control in audio applications, guitar, amplifier, audio, lamp, other dudio equipment arduino based projects and so on. 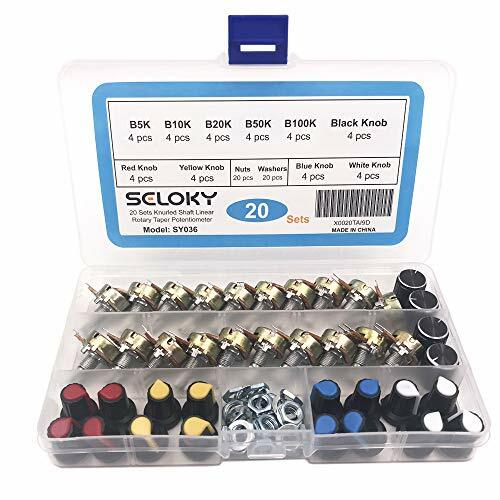 Handy kit to fix knobs on amplifier or other electrical appliances, all pots are fully functional and have smooth operation. 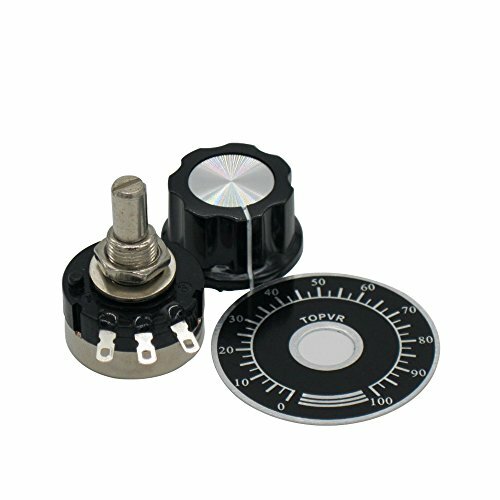 Once applied, these rotary taper potentiometer feel solid and precise when turning. [MARKING CODES EASY STORAGE] Single linear, type B, these rotary taper poteniometer values are marked with a readable string indicating the total resistance for easy recognition. They are manually adjustable variable resistor with 3 terminals. Two terminals are connected to both ends of a resistive element, and the third terminal connects to a wiper, moving over the resistive element. If you are learning electronics and having a hard time with regular pots. This kit do a good job for you. Feature: 5K Ohm Resistance, 10% Tolerance, 3 Terminals Potentiometer, come with a Dial and a Control Knob. 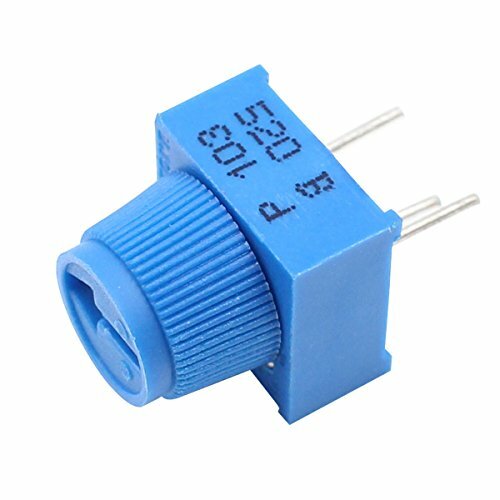 This Potentiometer is widely used to adjust timer, speed, temperature in all kinds of equipment's.